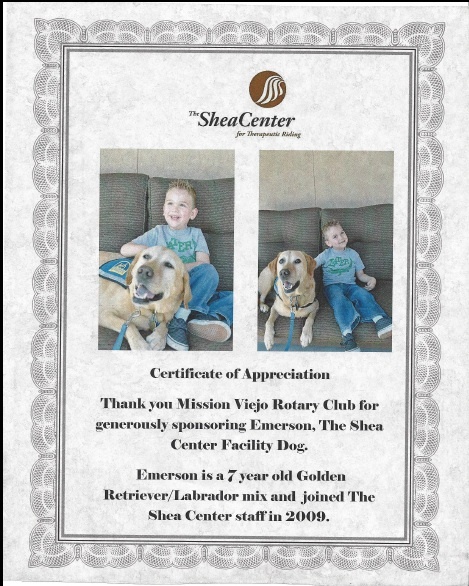 Shea Center recently recognized the Rotary Club of Mission Viejo for its generous support of the Center. The Club helps sponsor Emerson, a 7-year-old Golden Retriever/Labrador mix used at the facility. The J.F. Shea Therapeutic Riding Center is dedicated to improving the lives of people with disabilities through therapeutic horse-related programs. Some of the disabilities they assist with are Cerebral Palsy, Asperger's Syndrome, and Autism. For more information, visit www.sheacenter.org.